Painting a new construction project, or a home undergoing remodeling, requires two special considerations: high quality and a firm commitment to meeting deadlines. Monk’s covers both, every time. As a new homeowner, the last thing you want holding up your move-in date is the interior or exterior painting not being finished on time, or having to deal with painting problems. You deserve better. At Monk’s Home Improvements, we have extensive experience working with contractors and home owners on new construction paint projects. Our processes are designed to deliver top quality results on time and on budget. We are experts at scheduling just the right team for each project. We also play nicely with others. Most new construction painting involves multiple work crews on site at the same time working diligently on a common goal, so proper coordination is essential in order to deliver your new house on time. 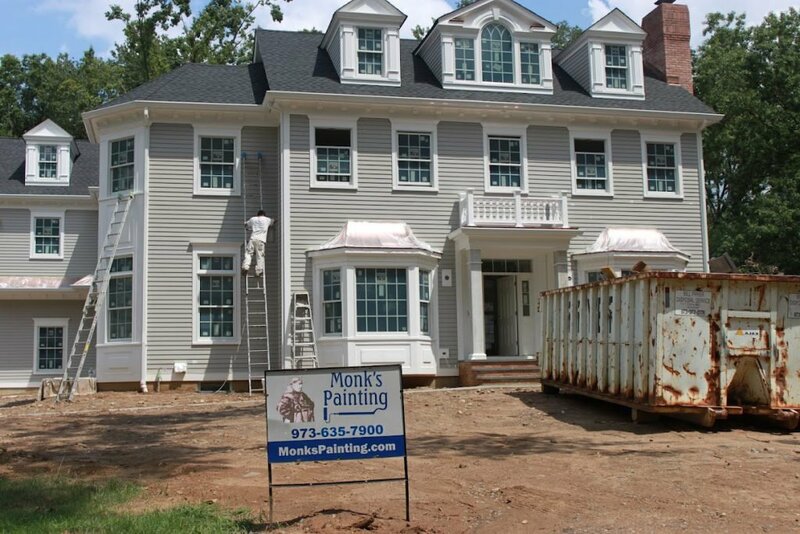 Painting a new home in New Jersey. Monk’s will keep your project on time on on budget. A free itemized estimate detailing all aspects of the project. Foreman on site each day. Proper wall preparation, which is essential in new construction for proper paint adhesion. Specific protection for your floors, cabinets, and interiors during painting. We only send qualified, trained professional painters to your home. Guaranteed project start and end dates. Contact us today at 973-635-7900 for a free estimate on your new construction exterior or interior painting project anywhere in the northern New Jersey counties of Morris, Essex, Somerset, and Union. See the full list of towns in our service area. Our defined and relatively small work service area ensures that each of our clients get the proper attention they deserve. This also allows us to be on site daily to make sure the work is done properly and to immediately address any concerns. Please contact us today at 973-635-7900 to take the first steps towards creating your dream home.